The White House Visitor Center provides an introduction to many aspects of the White House, including its architecture, furnishings, first families, social events, and relations with the press and world leaders. 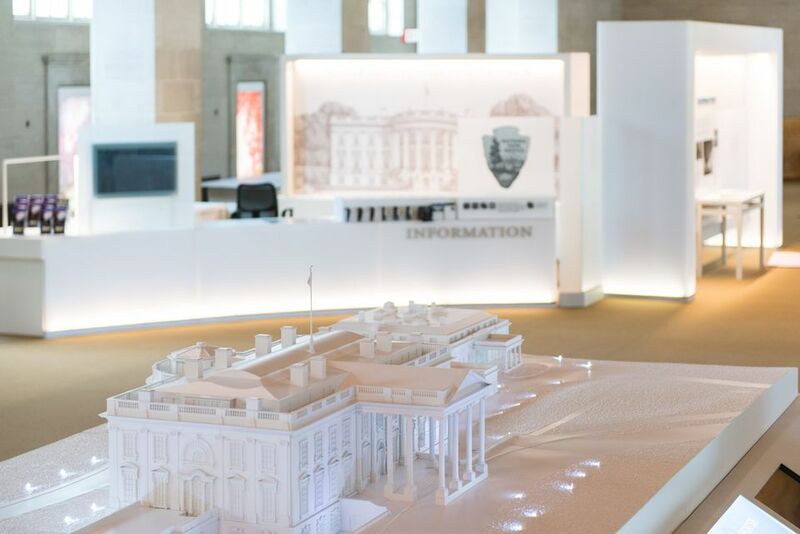 All new exhibits are now on display weaving together the stories of the White House as a home, office, stage and ceremonial space, museum, and park. More than 90 White House artifacts, many of which have never been on public display, give a glimpse into life and work inside the Executive Mansion. The White House Visitor Center completed a $12.6 million renovation which reopened to the public in September 2014. The project was a public private endeavor between the National Park Service and the White House Historical Association. Improvements to the Visitor Center include interactive exhibits and a model of the White House, as well as a new permanent museum gallery, a temporary exhibit area, an improved book sales area, visitor information facilities, and opportunities for children and families to connect to the history of the White House and President’s Park in new ways. Transportation and Parking: The closest Metro stations to the White House are Federal Triangle, Metro Center and McPherson Square. Parking is very limited in this area, so public transportation is recommended. A 14-minute film, "The White House: Reflections from Within," is very well done and provides insight into the experiences of the First Families. Note, the theater is located at the far end of the building, but if you start by watching the film you will have a better context for exploring the exhibits. "Who Ordered That?" is a fun interactive exhibit that shows the food preferences of some of the presidents. Take your time and enjoy a peek into the daily life of those who have lived in the White House. Learn about some of the staff like the White usher, chef, maitre d and housekeepers. The White House Historical Association is a nonprofit educational association founded in 1961 for the purpose of enhancing the understanding, appreciation, and enjoyment of the Executive Mansion. It was created at the recommendation of the National Park Service and with the support of First Lady Jacqueline Kennedy. All proceeds from the sale of the Association’s books and products are used to fund the acquisition of historic furnishings and art work for the permanent White House collection, assist in the preservation of public rooms, and further its educational mission. The Association also sponsors lectures, exhibits, and other outreach programs. To learn more about the Association, please visit www.whitehousehistory.org.